Caravanning would be easier if it was simply a case of loading up the caravan and tow vehicle with all of your gear, including the kitchen sink, and hitting the road. Rarely, though, is anything in life so simple. As you would know, every caravan built in Australia is built with specific payload capacity. What’s payload? We’re not talking munitions here. Rather, payload refers to the total combined weight of every item loaded into and onto the caravan. 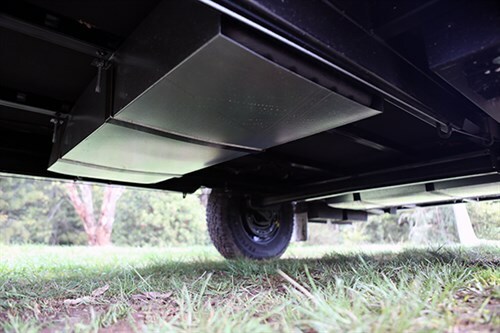 Every caravan has a specified Aggregate Trailer Mass; that is, the total permissible weight of the caravan, after it’s loaded up, as allowed by the manufacturer of the caravan. But you already know this. So why am I bringing it up again? Well, I was reviewing a caravan the other day. A nice rig built by an ethical, reputable company. The dealer is also highly reputable and I’ve had many happy dealings with it in the past. When you’re buying a caravan, issues concerning weight and payload have the potential to get complicated. This particular van, for example, was specced up by the factory, with features including a roof-mounted solar panel. Because these features were fitted by the factory, they were accounted for in the Tare (unloaded weight) figure noted on the van’s compliance plate. Then the dealer drew to my attention the storage box on the drawbar. This, I was told, was fitted by the dealer and weighed about 10kg. As such, it’s considered payload. Whoever buys that van will have to factor in that 10kg when loading up their caravan. Effectively, the 300kg payload suggested by the van’s compliance plate is instead 290kg. Because Tare weights in Australia are generally measured ‘dry’ (i.e., with empty water tanks and gas cylinders), by the time you’ve filled this van’s dual 80L on-board water tanks, as well as the dual 9kg gas cylinders, you’ve eroded another 178kg of payload. That leaves 112kg for your food, clothes, camp chairs and the like. Is this enough? I realise we don’t all weigh individual items before they go into the van – that would probably be considered obsessive – but why not try it once? I think you’ll be surprised by how much that jacket and tub of rice weighs. Of course, in the case of the van in question, there’s no rule that says you must travel with both water tanks full. (But if you were to only fill one, I would suggest filling the one forward of the axle and making sure the other was completely empty, lest sloshing water affect the van’s stability under tow.) 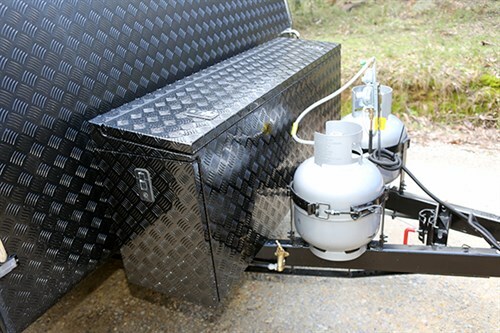 Assuming you’ll be able to fill the extra tank upon arrival – or can make do without the additional water – that extra 80kg of payload might be the difference between a legal and illegal towing setup. The same applies to the second 9kg gas cylinder. In my experience, 9kg of gas can go a long way – one is probably sufficient. Getting back to that storage box. It was a well-built unit, certainly, but arguably unnecessary. You see, the van had a generous tunnel boot already. That storage box might just encourage its owner to load up unnecessarily, adding unrequired weight to the towbar and potentially exceeding the tow vehicle’s maximum towball mass. So when shopping for a new van, be sure to ask the dealer if any items have been fitted after the van rolled out of the factory doors. A kilo here and a kilo there might seem acceptable, but when you’ve only got 300 of them to start with, that extra weight might come back to bite you.